Brazilian Fortresses Ensemble is part of the Tentative list of Brazil in order to qualify for inclusion in the World Heritage List. In August 2018, I visited Macapá, the capital of the Brazilian state of Amapá, the only pair not covered by Lonely Planet, so I wasn’t surprised that there weren’t any other tourists. One of the benefits of a 40-minute flight that departed from Belem at 4:10 am was that I arrived early enough on the northern bank of the Amazon to watch the sunrise over the world’s largest river. Macapá’s only noteworthy site is São José Fortress, built in 1764 by the Portuguese to guard the mouth of the Amazon. The fort basically sits on the equator and is the northernmost fort in the tentative site ensemble. Santo Antônio da Barra: The most famous of all 5 forts, it is usually called just Barra lighthouse (Farol da Barra), because there's a typical striped lighthouse inside the fort. It is very imposing, and settled in a nice place, with beautiful views of the coast and the nearby Santa Maria Fort. The entrance is not free, as it functions as the Nautic Museum of Bahia. The exposition is ok, it must be more interesting for people who likes ships, not much my case. The visitors can also go to the top of the lighthouse. 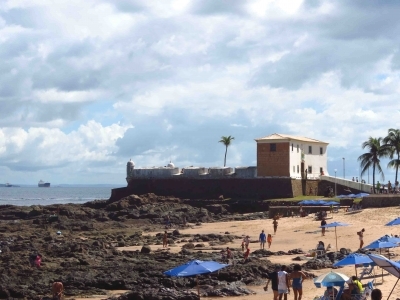 It is a must-see if you're in Salvador, a typical fort, very well preserved, and easy to reach, as it's located in a very touristic area. Santa Maria: From Santo Antônio da Barra you can reach this fort by foot, as well as São Diogo. It is a very pleasant walk along the Barra beach. Santa Maria is a small fort, very simple compared to Santo Antônio da Barra, but I really like it, it is very well conservated (it was restored in 2016) and the location on the beach is beautiful (picture shows the view of this fort). Right in the entrance there's a screen showing the locations of all forts of Salvador and some history of them, a nice detail. Entrance here is free, except for the exposition space, that is very small, and don't show much of the structure of the building (the museum area of Santo Antônio da Barra does), so if you're interested only in the fort, you can pass the exposition, here about photographers of Salvador. If you do like photography, it can be interesting, but you will not see many photos hanging on the walls, it is very digital. São Diogo: This one is very related to Santa Maria because they were constructed at the same time. It is also small and simple, but the location, on the slopes of a cliff, makes it a strange fort, it doesn't look much like one. It gave me an impression it's just some kind of layered, narrow squares. The views of the bay are the best part. Entrance is also free except for the exposition space, here dedicated to Carybé, a local artist. Like in Santa Maria, it's a digital exposition, don't expect to see his real work. São Marcelo: It's probably the most interesting one, but also the most complicated to check, even when it is open to visitation: it is totally surrounded by the sea, so it's only possible to reach there by boat. Its circular shape make it looks like an island. It is not very far from the land, but there´s no great views from the coast. Best way to see it is from the Upper old city of Salvador (part of WHS area), in Tomé de Souza square, next to Lacerda Lift (check the porch of Rio Branco palace, entrance is free), or from the Nautical terminal, close to Modelo market. The problem to check it from the terminal is that I think you can't go inside the area with the views of the sea and the fort if you're not going to some boat trip. I'm not sure about that, I don't remember well because the terminal was crowed. The fort is close to the terminal, so as I made a day trip to some islands I was able to see the fort closely, from the boat. I think it's the best that can be done while it's closed. Nossa Senhora de Monte Serrat: A more distant fort, in Ponta de Humaitá area, a not very touristic area. I remember only a few people there. The fort was closed, but I think it was because the time I went, around midday. I don't think it is closed for renovation or something like that, it was just bad luck. Anyway, I was satisfied to check it just from outside, because it is a peculiar fort, with huge cylindrical towers, instead of the usual little lookouts of the bastions. It is a small fort, like Santa Maria, but the towers and the long staircase of the main access make it imposing. Conservation, however, could be better. Well the focus of this little side trip wasn't really to get inside the fort in Niteroi, rather it was to cruise across Guanabara Bay and visit the town’s iconic MAC art gallery. This was well worth the trip, even though the gallery itself wasn't open. The sailing across the harbour gave us the closest view of landing planes we are ever likely to have and the gallery enabled us to see one of Oscar Niemeyer's defining works. From underneath its Flying Saucer like bulk you actually get a good view of the two forts at the entrance to the bay. In regards to the actual nominated fort, it is quite a long journey from the ferry port and it is a functioning military base so we didn't really want to spend several hours on public transport getting to a locked gate, we only had a short stay in Rio and this didn't look like the best use of our time. The ferry affords another perspective of the mouth of the bay and from a distance you can again clearly pick out the two forts opposite each other getting a good sense of their defensive role. On our second night staying in the very recommended area of Botafogo, we decided to stroll through to the neighbourhood of Urca. Situated underneath Sugarloaf Mountain, this lovely relaxed area is home to some nice waterfront bars offering views up the harbour to the city centre and especially of the planes circling to land at Santos Dumont airport. (The photo gives an idea of what you can see from outside in Urca, namely that green headland in the centre of the picture, not really much in the way of military defences on display). It seems if you do want to visit you have to phone the military public relations office and arrange a tour, how simple this process is I'm not sure. Hey ho, we had to make do with a waterside picnic as the sun set on one of the world's most unique and iconic cityscapes, it's a tough life sometimes. Visits need to be prearranged as of 2018 this seems to be the schedule Mon-Fri 09:00-16:00 Sat 09:00-12:00. Full details on the military visit page here. The whole time I wasn't really that worried about my failed visits as I had seen that Copacabana Fort was open to visitors and could provide a suitable focus to an afternoon trip to Rio's famous beaches. As it was we had a rather enjoyable visit, with some lunch at the pleasant cafe overlooking the eponymous beach and Sugarloaf mountain. There was plenty of military hardware on hand and a museum, but the main points of interest to us were the views. Alas, when I got back home and started mapping the Tentative List it turns out that Copacabana Fort isn't part of the proposal! It seems the nominated forts were all built by European Colonial regimes (mostly Portuguese) and that is what the focus of the Outstanding Universal Value (OUV) is: European attempts to shape Brazilian defences in their own image. However because Copacabana wasn't really opened up until the 1800's the fort there was built by the Brazilian government so isn't included. So I can't really talk about the OUV of the sites as the one I visited in detail doesn't represent the main concepts. If this site is inscribed I'm not really sure if I will count it as a visit, I'm not fully convinced I would have entered into the core zone, however I did feel I got a good view of the fortifications from the sea and I stood at the entrance of one of them, but it will probably be a frustrating “close but no cigar”. 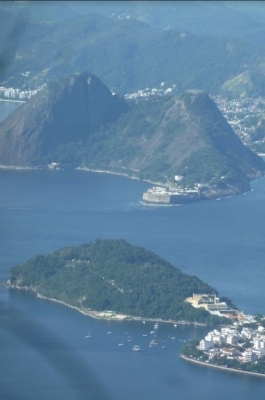 -If you want to visit the two nominated forts in and around Rio you will need to arrange a guided tour in advance as they are both in active military use. -A visit to Niteroi's MAC gallery and the ferry crossing from Rio gives a good, though somewhat distant view of the two forts guarding Guanabara bay. - Copacabana fort isn't part of this proposal, however it is worth a visit for the impressive views it gives of the eponymous beach, back to Sugarloaf Mountain.